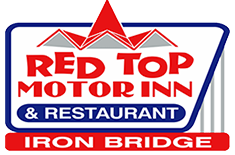 The Red Top Motor Inn & Restaurant is located in the village of Iron Bridge in the Municipality of Huron Shores, Ontario, Canada. A unique landmark in Iron Bridge, the Red Top Motor Inn is the perfect location for travellers along Hwy 17. We are located in the village of Iron Bridge in the Municipality of Huron Shores, in Ontario, Canada. Our unique main building, designed in the Festival Style and opened in 1961 is a landmark on Highway 17. © 2019 Red Top Motor Inn. All Right Reserved.